Although Arizona wine has come a long way over the years, in both taste and recognition, it’s still not the first place that most people think of when it comes to top wine producing regions. So the real question is: why drink Arizona wine? What makes it special and why should it be at the top of your list when you go searching for your next bottle of wine? While the Arizona wine industry was formed in the 1980’s, it took over twenty years before people really began using the region to produce grapes and understanding that amazing wine could be produced on Arizona soil. Most people when they think of Arizona immediately think of hot desert heat and cacti galore, but in fact this state in more varied in climate than most people know and there are a few regions in Arizona that have ideal climates for vineyards. The three most famous of those regions are Wilcox, Sonoita, and the Verde Valley. While there are a few other places in Arizona where wine can be and is produced, these three regions make up the large majority of wine acreage in the state. The weather in these areas creates a microclimate with good temperatures, soil, and water that help produce grapes that turn into great wine. Each wine growing region in Arizona is slightly different because of the elevation, soil, typical weather, average rainfall, etc. Sonoita, located in Santa Cruz County, has been compared to the Burgundy region of France, and is home to some of the longest established wineries in Arizona. Wilcox, located in Cochise County, produces a wide variety of wines and the grapes produced here are used in wines all across the state. This region can be compared to the Rhone Valley in France, and the grapes grown in Wilcox are most known for being produced in soil rich in volcanic ash. Verde Valley grapes are similarly also produced in volcanic ash soil, giving them a complexity in flavor that bodes well to varietals such as Syrahs and Sangioveses. Wineries and wine tasting rooms are popping up in major and small cities across Arizona, and Arizona wines are beginning to gain recognition and popularity among wine drinkers. This trend is not only exciting for those of us that like to drink and support local, but it is also bringing in tourism and excitement from other out of state wine lovers as well. This idea of drinking local, supporting the Arizona wine industry, and building even more excitement around this growing wine region, was what drove us to start the Grand Canyon Wine Company and our Tasting Room in Downtown Williams. The Grand Canyon Wine Company works with local Arizona wineries to produce our own wines, selected each year to reflect what has grown well in the region and what we want to showcase. In our Tasting Room, located on Historic Route 66, we not only feature our own wines but also many other Arizona wines. We have whites, reds, roses, sparkling, and everything in between that is produced within Arizona state lines. It’s our hope that by supporting and offering local wines to travelers from near and far that we can help everyone see why they should drink Arizona wine and why it should be one of the first places that comes to mind when you think of wine producing regions. While “Blonde Stout” might sound contradictory and even a bit confusing, this beer style is worth exploring a bit more and definitely worth trying. Our Blonde Stout, named LA Face with an Oakland Booty, is full of all the flavors you’d expect from a dark Stout, but with the color and appearance of a Blonde Ale. This beer was first brewed by Historic Brewing Company back in 2017, and after much baggering by our managers we brought it back for you all to try. This beer has an ABV of 7% and an IBU of 30 and was brewed with 2-row, oats, biscuit and bru malt, which gives this beer lots of malt flavor and depth. It has a strong aroma and flavor of coffee, hazelnut, and chocolate with a silky and full mouthfeel. LA Face is brewed like a traditional Stout, but does not have any roasted or chocolate malts added which typically make Stout style beers a dark, rich color. This Blonde Stout is a pale golden color but carries all the flavor characteristics of a dark beer, which makes it a real mind trick if you don’t know what you’re ordering. After the initial brewing process we added 8 lbs of local coffee, 10 lbs of cocoa nibs, and hazelnut extract to add even more flavor to this beer. You definitely smell the coffee and hazelnut in the aroma first, followed by a subtle chocolate roasted smell that makes you want to dive right into the beer. When you taste the beer you notice the sweet malt flavors first, followed by the strong coffee and nutty hazelnut flavors which round out into a dark chocolate finish. The beer name LA Face with an Oakland Booty was inspired by Sir Mix a Lot, and just like the famous song we all know and love this beer will be your new jam. It’s an oxymoron for sure, but that just makes us want it even more. It’s full of delicious flavor and if you haven’t had a Blonde Stout before we can’t wait for you to try out this awesome style of beer. LA Face with an Oakland Booty is on tap now at our locations, so go seek out this tasty brew and see how many people you can trick with this light colored Stout. Three cheers for Spring beers! The flowers are blooming, the sun is shining, and it’s finally porch drinking weather - which means it’s also finally time for our favorite Spring beer styles. Here’s a roundup of all of our favorite styles to pour while April showers bring May flowers. Berliner Weisse: It’s no doubt that here at Historic Brewing Company we are big fans of Berliner Weisse beers. They’re light, tart, full of flavor, and a crowd pleaser among sour beer fans and those that are slow to get on the sour beer train. Spring Berliner Weisse beers are bright, fruity, and the perfect beer for after a great trail run or for a breezy spring night. We are partial to our own Spring Soulstice Saure which features Azacca hops, giving it a flavor and aroma similar to Watermelon Sour Patch kids. It’s a subtle sour beer with a soft wheat flavor that pairs well with it’s tropical and citrus flavor notes. Munich Helles: Although Bavaria is home to so many incredible beer styles, one of their best and brightest beer styles is the Munich Helles. This style was first brewed by the Spaten Brewery and has since grown in popularity due to its simplicity and easy drinking nature. Munich Helles are yellow to gold in color and highlight the Pilsner malts giving it a malty sweetness accompanied by the slight hop bitterness. They are low in ABV and are perfect for any day filled with sunshine and good company. IPL: This hybrid style is gaining popularity, and for good reason. It combines the best of two of our favorite beer styles, blending together the hop flavor and bitterness from an IPA and the crisp and clean qualities lagers are known for. IPLs are a hoppy lager that help bring together the biggest hop heads and those that don’t stray too far from their love of lagers, giving them a beer to all celebrate together. While this beer style is versatile enough to enjoy all year round, it’s particularly delicious in spring and lucky for you we’ve got an IPL beer in the works right now which will be released early May! Each year as a company, Historic Brewing Company uses our Charity Brew With Us Program to collaborate with some amazing local charities to not only create an awesome collaboration beer, but to also raise awareness and money for organizations that we stand behind. This month we had the privilege of working with Elevate Nepal, Inc., a non-profit that is based out of Flagstaff and works to raise money for relief work and rebuilding projects in Nepal following the devastation of the 2015 earthquake. The 2015 earthquake in Nepal was the largest natural disaster Nepal had experienced in over eighty years, and the aftermath of this huge earthquake destroyed many of the countries villages and killed and injured thousands of people. Although the government was able to provide some disaster relief, the hit that the country took and the decline of the economy after the natural disaster has meant that rebuilding efforts have been slow and stagnant. This means that many people are still living in cramped shelters and many children have limited access to education. Elevate Nepal, founded in 2017, has been working closely with the Nepalese people to improve conditions, provide children with schools, families with homes, and provide better sanitation and resources for all. The founders, Dan and Anthony, visited Nepal for the first time in 2011 where they spent a few months trekking Mt. Everest base camp and volunteering in local villages. This is when they first visited the coffee farm near Pokhara and when they fell in love with the country and the values of the Nepalese people. After the devastation of the 2015 earthquake, the men came together to form Elevate Nepal in an effort to help the country rebuild itself and create more jobs within the villages and empower the communities. We were lucky enough to get connected with Dan Maurer when he approached us about his yearly charity event that this year raised more than $12,000 for their current and future rebuilding projects. It was also then that Dan informed us about the amazing way the charity is raising money all year long and the agriculture they are helping build in this small village by working with the coffee farm and importing speciality Nepalese coffee into the United States. The Sapana coffee beans are grown in the shade of the Himalayan mountains and then imported to the US and roasted in Phoenix, before they sold to the public both online on their website and at their events. It is pesticide free, organic, free trade and speciality grade coffee, and Elevate Nepal is one of only three companies in the United States to import coffee from Nepal. After learning about Elevate Nepal and the important work they are doing, we knew we wanted to partner up with them to create a kickass beer and help them raise money for even more rebuilding projects. This is how the Sapana Coffee Stout was born - a chocolatey, slightly sweet stout that is bursting with coffee flavor and subtle nutty notes. We used the Sapana coffee beans in this beer to truly infuse an element of Nepal and Elevate Nepal’s mission into every pint. The Sapana Coffee Stout has lots of coffee flavor from the addition of Sapana coffee cold brew added in to the beer. It is a light-bodied, dry stout that has a good bitterness from the coffee and the hops. The aroma and flavor of this beer reminds our head brewer, Zack, of iced coffee with cream and sugar, making it an easy to drink dark beer. The Sapana Stout has an ABV of 4.8% and an IBU of 20, although the perceived bitterness is a bit higher because of the natural bitter qualities of the dark roasted coffee. This beer is perfect for both coffee lovers and beer lovers, and for those that want to support an awesome organization doing great work in the world. This beer was first tapped at the Big Lebowski Charity Bowling Event on March 2nd at Starlite Lanes, but it is now also tapped at our Historic Brewing Company locations. Additionally, we will be hosting an awesome event at our Downtown Historic Barrel + Bottle House location to raise even more money and awareness for Elevate Nepal, and to give you all a chance to try this beer, the Sapana coffee, and even buy some Nepalese coffee beans to take home with you. Join Historic and Elevate Nepal on March 23rd from 6-9pm for a pint night and coffee tasting. You can try the Sapana Stout side by side with the cold brew that was used in the beer, and $1 from each pint of the Sapana Stout sold that night will go back to Elevate Nepal. They are currently working on rebuilding a school that will allow 700 kids to continue their education, and by coming down to our event you can help support them in this project and their awesome mission as a whole. We hope to see you there, and if you can’t join but want to help out this cause go to Elevate Nepal’s website and read more about what they do, donate, or buy some Sapana coffee beans! What is a Rye Beer Anyway? While rye beer isn’t a style all on it’s own, adding rye to a beer changes a beer so completely that it might as well be. Rye is an ingredient that can be included into the malt mixture when brewing, transforming beer styles with it’s earthy, spicy taste. Rye has been added to beers for centuries, however, it is just now becoming trendy with most breweries producing a rye beer seasonally or as one of their mainstays. Rye works best in more complex beers like IPAs, Pale Ales, and Stouts, but we have also seen it successfully added into lagers and pilsners. To be considered a “rye beer” the finished beer must have a significant amount of rye in the grain bill and strong rye flavors present within the beer. The addition of rye will add a characteristic spice to any beer, similar to pumpernickel bread. It can also change the color of the beer to include more of a reddish tone. We are a fan of adding rye to IPAs because the dry, astringent spice of the rye plays well and highlights the hop’s bold and bitter flavors. Our seasonal take on the Rye IPA is Joy Rye’d, a beer that Historic has been making for years with a devoted fan base of its own. This Rye IPA has a slight spiciness on the nose with a hop forward smell that is pleasant and not too aggressive, pulling you in from first whiff. As you sip Joy Rye’d you can taste the earthy flavors from both the rye and the hops that this beer is brewed with. This beer is crisp, with a malt forward taste and a strong hop backbone. The beer finishes with the rye aftertaste, hop bitterness and a delicious spiciness. It’s a definite rye spiciness, similar to the flavors that linger after you chew on a fresh piece of rye or pumpernickel bread and it lingers on the palate long after you’ve taken your last sip. Rye beers have grown in popularity over the last ten years and we don’t see them going anywhere anytime soon. They contribute dimension, spice, and great flavor to the beer styles they are added to, and as more and more brewers get comfortable adding rye to their grain bill, we’ll continue to see new awesome rye beers emerge. Our Rye IPA, Joy Rye’d, is a favorite among many for its distinct flavor. This beer will be back on tap at all of our locations by the end of January, but it’s a small batch so don’t hesitate to expand your palate and grab a pint of it before it’s all gone. Did you know that right here in Northern Arizona we have our very own Wildlife Park featuring 160 acres of land, and hundreds of amazing animals? Bearizona Wildlife Park, located in Williams, Arizona, is home to many rescued and relocated animals that have been given a second chance. Bearizona is fun for the whole family and features both a drive through and walk through section of the park, making it accessible for all. Bearizona is also home to Canyonlands Restaurant, a themed restaurant within the Kennelly Restaurant Concepts family, with options for even the pickiest of eaters. Canyonlands Restaurant also has a full bar inside featuring our very own Historic Brewing Company beer and Grand Canyon Wine Company wine. Although the ability to walk around the park with a craft beer in hand is one of the awesome things about Bearizona, there is so much to enjoy on any day you choose to visit. They have live animal shows each day, featuring a rotating cast of their amazing animals and staff. These shows are interactive, educational, and super fun to watch and be a part of. The drive through section of Bearizona is unlike most Wildlife Parks because through your car window you can see animals such as wolves, bison, bears, and more. Last week, we at Historic had the privilege of going behind the scenes at Bearizona and meeting some of the animals and taking up close photos of them in their habitats. We were even lucky enough to let some of our favorite animals play with Historic Brewing Company cans, which made for a fun experience for us, people hanging out at the exhibits, and the animals. It was awesome to get to go into some of the enclosures, get up close with the animals, and see how they interacted with a new object. Don’t worry though, we emptied the cans before they were given to the animals, the staff was close by, and the cans were removed after taking photos so the animals were just given a fun chance to get curious about what we had to share with them. One of our favorite parts of Bearizona is the stories behind the animals that were brought to the park, and how much their trainers and all of the staff at Bearizona care for them. Two of the bear cubs that got to play with the cans and get a tasty treat of maple syrup were rescued as babies from the Pinetop area. Their mother had been fed by a human and the whole family was in danger, so the cubs were rescued and rehomed at Bearizona. The two girl cubs share a large enclosure together and are loved by everyone who comes to see them. When they’re not playing with cans of Oceanfront they love to lie around in the sun, take lots of naps, and even try to climb the trees. Bearizona is the perfect day trip from Flagstaff and makes a great destination to go to from anywhere in Arizona. It is family friendly and fun if you’re two years old or eighty-two years old. There’s something for everyone to do at the park and the staff is knowledgeable and excited to share what they know about all of the species that call Bearizona home. The park features a big restaurant with a variety of delicious items and a full bar with liquor and our own Historic beer. They also have a small outdoor grill restaurant with selected items, and a patio bar. If you haven’t made it to Bearizona yet we definitely suggest adding it to your list of go to destinations. Tell the bears we said hi! We won’t get too geeky on you, but in Norse mythology there was a wolf so monstrous that he had to be chained up for fear of his strength and his propensity for evil. As the story goes, Fenrir broke through his chains twice, and bit the arm off of the god Tyr before he was finally chained to a rock and gagged with a sword, left to die until Doomsday. Of course a wolf as big and great as Fenrir wouldn’t go down without a fight, and as the legend goes he fought against the chief god Odin and swallowed him whole. We tell you this whole story, because not only is it totally badass, but it’s also the inspiration behind our newest IPA. The Fenrir IPA was brewed with Styrian Wolf hops from Slovenia - hops that are extremely special and drew us in from the moment we saw the name and read the flavor notes. The Fenrir IPA has an IBU of 70 and an ABV of 6.9% with a slightly sweet, tropical floral aroma. It is hop forward with flavors of grapefruit pith, tropical orchid, and hop spiciness. It has a delicious bitterness to it with little malt flavors because we wanted this beer to be all about the hops. Speaking of the hops, this beer was brewed in a straightforward single mash infusion with a small amount of Nugget hops for bittering, Styrian Wolf hops for flavor, and Pale Ale and Crystal 10 malts. These unique Wolf hops were shown to Zack, our head brewer, by the awesome guys at Proximity Malt who work with Hop Head Farms and distribute this hop and many other varieties of hops. This select hops is completely different than any other we have brewed with, and Zack couldn’t wait to create a beer based around their unique flavor and aroma. The Fenrir IPA, inspired by a wolf incredibly giant and evil, is the perfect beer for anyone who loves big hop flavors but wants something totally new and unique. This hop variety hasn’t been used in many beers before and is a first for Historic Brewing Company. This beer will be tapped at all of our locations starting December 14th, and you’re not going to want to miss this small batch, bold India Pale Ale. Have you ever wanted to engineer your own beer? Wanted the opportunity to work with a seasoned brewer to formulate a beer that you’ve always wanted to taste? Well the folks at Civil Design and Engineering Inc. in Flagstaff got to do just that. They knew that they wanted to make something extra special to give to their employees and their clients this year for the holidays, and that’s where we at Historic stepped in to help make that dream a reality. CDE approached us earlier this year with the proposition of brewing two distinct beers that would be made specially for them and later canned as gifts to the people in their company and their clients that work so hard all year. We knew this would be something fun and unique and we couldn’t wait to work with their team to brew something great. Over the course of a few months we were able to help them engineer two beers that were perfect for them. Our head brewer, Zack, sat down with a few members of their team and brought them out different hops, different malts, and a few samplings of our own beers to get clear on what it is they wanted. 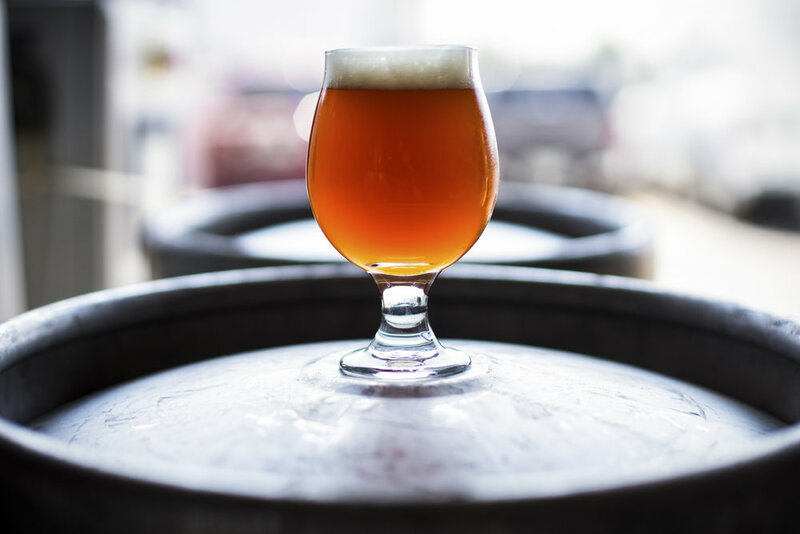 They knew that they wanted to brew one IPA and one Porter so that narrowed it down, and from there Zack worked with them to decide on flavor characteristics, bases of the beers, and the specific taste that they were going for. A group of employees from Civil Design and Engineering Inc. then joined us over the course of two different weekends to be a part of the brew. They worked with our Assistant Brewer, Austin, to start the brewing process and get a deeper understanding on how their beer would be made. From there the fermenting magic happened and about five weeks later their beers were kegged out into this world. The end result was a piney, citrus IPA and a Hazelnut and Cacao Nib Porter. The IPA has an IBU of 6.6% and an ABV of 77 with a maltier base, more similar to an East Coast style IPA than some of the other IPAs that we have brewed in the past. It has Amarillo, Centennial, Columbus, and Nugget hops which all work together to create the bitter, pine, and citrus flavors that CDE wanted to achieve. This beer is malty, while still having lots of hop flavors, and different than other beers we’ve brewed in the past as it was engineered to meet the desires of CDE. The Hazelnut and Cacao Nib Porter is a big, bold Porter, closer to an Imperial, with an ABV of 7.5% and an IBU of 14. They designed this beer after tasting Pete’s Hazy Nuts, a Hazelnut Porter we had on draft a few months ago, but we made this beer even bigger and more special by adding in more chocolate flavors with the cacao nibs and making it an Imperial with a high ABV. It’s the perfect beer for a celebration and a great way to thank the special people in their firm. Working with a local business to create two unique and special beers was an awesome experience and something we’d love to do again. The process of engineering and designing their own beer really spoke to the team at Civil Design and Engineering Inc. and was totally up our alley as well. They now have two extraordinary gifts for their team and got to be a part of the deciding, the actual brew, and have a tasting afterward at our brewery that truly made them a part of the experience. If you’re interested in designing your own brew for your company or organization contact us at info@historicbrewingcompany.com.